Autumn is coming, in Japan and almost all countries in the temperate and subtropical northern hemisphere, it is the repotting season for some plants like those of the Rosaceae family, a rose, a Japanese quince and a pyracantha. 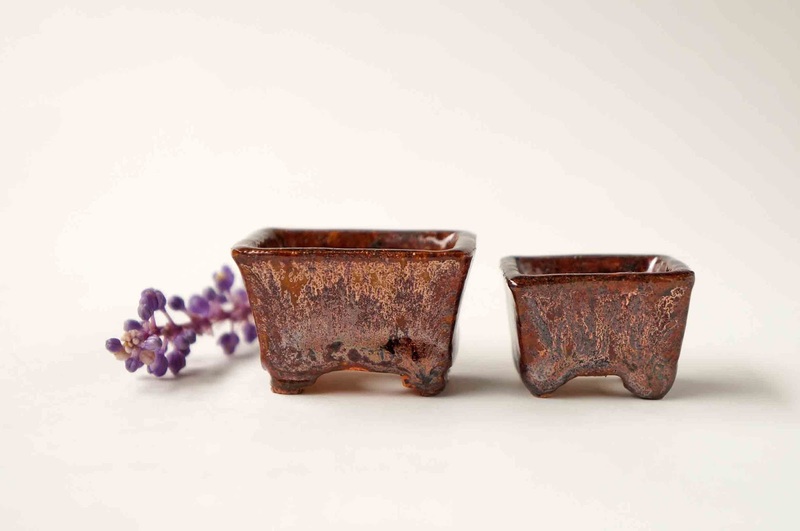 So today, I will introduce some glazed bonsai pots that would match beautifully with plants especially in autumn. 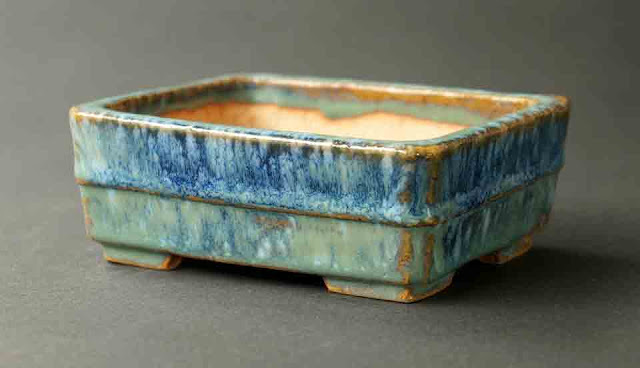 This rectangle bonsai pot was fired last July by the Tokoname potter, Hidemi kataoka. I heard from him that the pot is covered with 3 glazes, light green, yellow and blue. 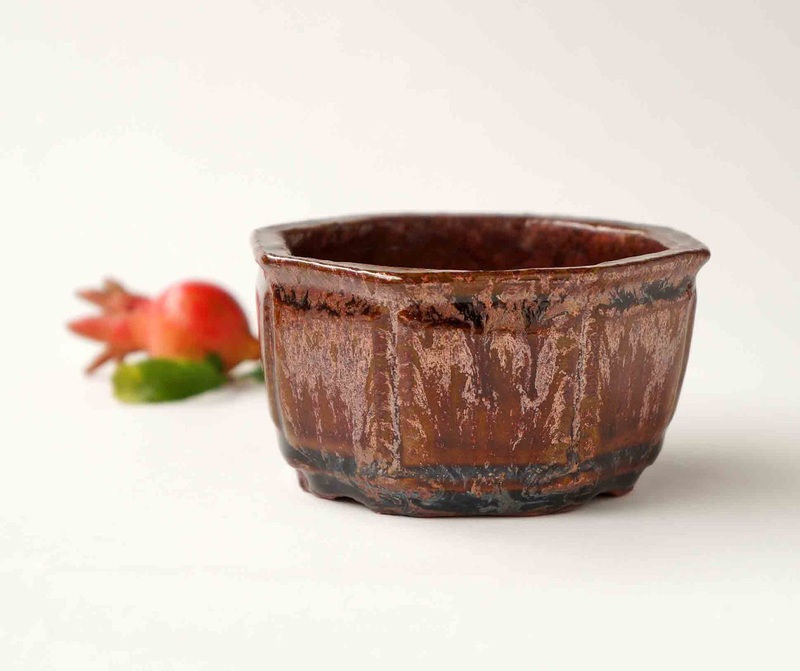 That’s why the Oribe (green) glaze of the pot looks beautiful with such a depth of color and such glaze brings out the red flowers of a Japanese quince, the little red fruits of a pyracantha and the bright pink flowers of a camellia. I think this Aventurine glazed pot is one of Hidemi’s representative works. 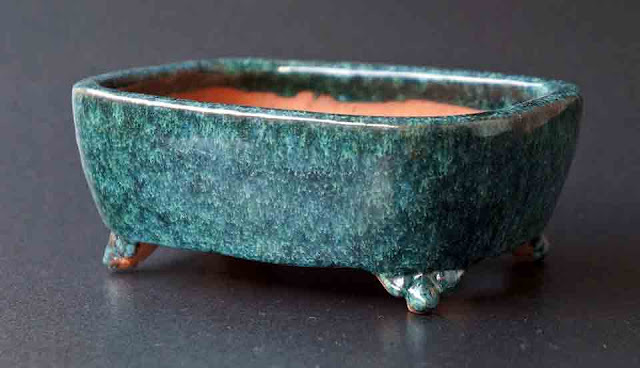 The many iridescent small crystals shining in the brown glaze are really beautiful. They remind me of the gold color of the autumn evening with a gorgeous sunset. If plants such as a bush clover, a Japanese Beautyberry (Callicarpa japonica) and a Chinese Bellflower were potted in the glazed pot, they would show the colors of their flowers or fruits most beautifully. This pot is absolutely one of masterpieces made by the Tokoname potter, Koyo. The flowing pattern with the blue and green glaze on the side of the pot makes me imagine a deep ravine in the middle of a mountain. The glaze will bring out the maple leaves turning red very well. By the way, I know it is spring, and the repotting season now in Australia, South-Africa and many other countries of the southern hemisphere. 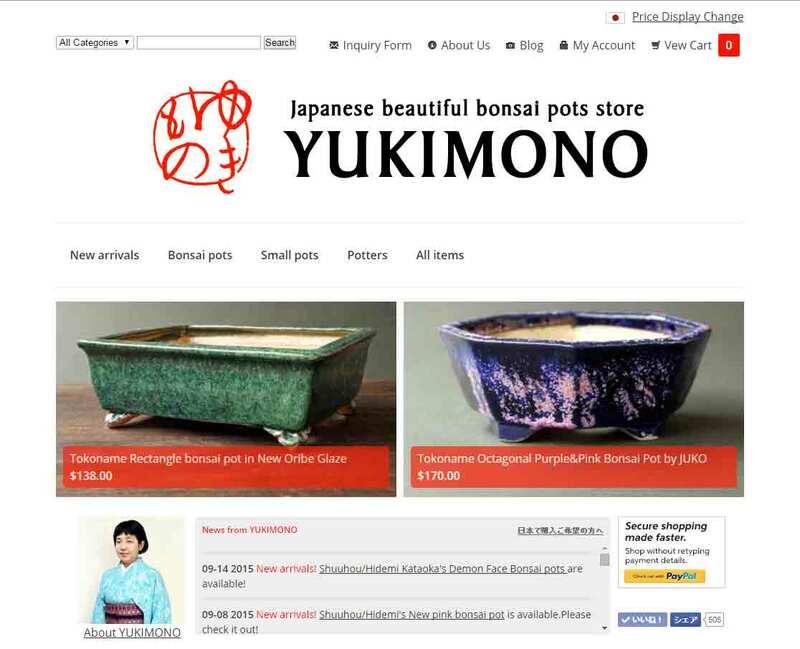 If you are interested in these bonsai pots, please have a look here.